I posted our weekly meal plan on Monday. According to the plan, we were going to have leftovers or chicken nuggets last night, but as I realized around noon yesterday, we had no leftovers and only four chicken nuggets. Fortunately, we did have all the ingredients for a steak dinner (which was supposed to be our Thursday meal) already in the fridge, so I prepped that at lunchtime instead. At lunchtime, I mixed up the marinade for the steak in a Ziploc bag, added the flank steak and put it in the refrigerator. Next, I washed and trimmed the cauliflower, and cut it vertically into slices. Then, I put the cauliflower on the baking sheet and popped it all in the fridge for later. I know you’re waiting on the edge of your seat to find out WHAT HAPPENED NEXT. Well, I’ll tell you. I went to pick up my kids. And then I pretended to be interested in them while secretly watching the clock, waiting for it to be time for mommy to “go fix dinner” (which is code for “go drink wine”). You should totally come over and fix dinner with me sometime! 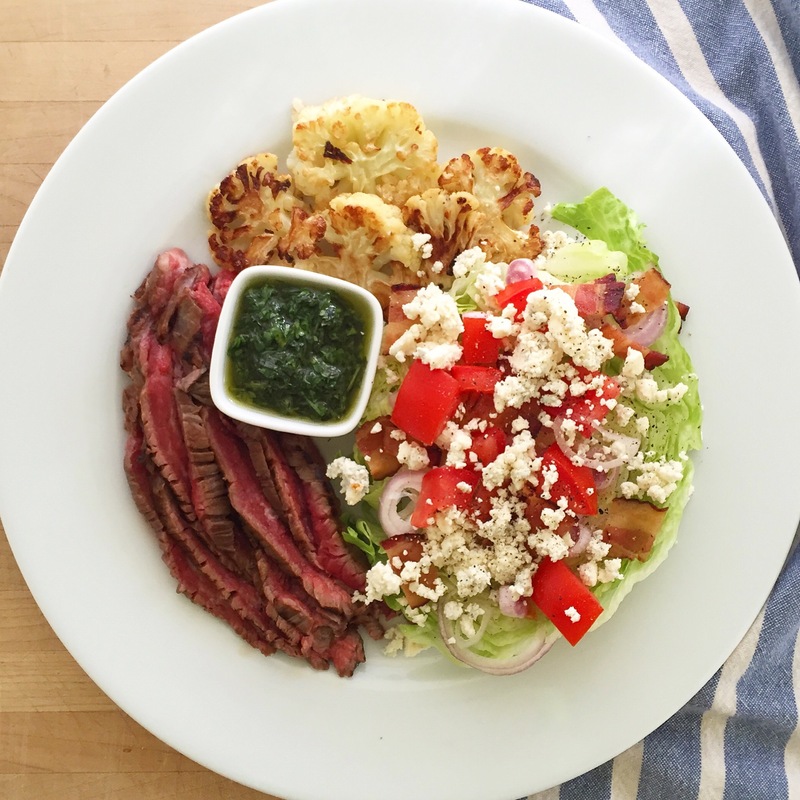 In the meantime, here are step-by-step instructions so you can make this simple steak dinner in the convenience of your own home! Hope you have a chance to try it! If you’re looking for some other family-friendly meal ideas, check out the salmon dinner and taco dinner from earlier this week!